Dimmit County is a county located in the state of Texas. Based on the 2010 census, its population was 9,996. 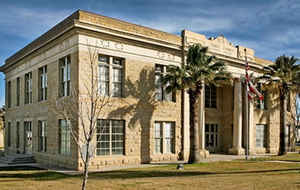 The county seat is Carrizo Springs. The county was founded in 1858 and later organized in 1880. It is named for Philip Dimmitt, a major figure in the Texas Revolution. The spelling of the county name and the spelling of the individual's name differ because of a spelling error in the bill creating the county name. Paleo-Indians artifacts indicate these people lived in Dimmit County as far back as 9200 BC. Archaic period (6000 BC to AD 1000) up to the arrival of the Spanish brought increased hunter-gatherers to the area. These Indians subsisted mostly on game, wild fruits, seeds, and roots. They carved tools from wood and stone, wove baskets, and sewed rabbitskin robes, made pottery and hunted with bows and arrows. Their most effective weapon was the atlatl, a throwing stick that greatly increased the deadliness of their spears. Coahuiltecan Indians native to Dimmit County were later squeezed out by Apache and Comanche. Hostile tribes harassed settlers, forcing some to pull up stakes. Texas Rangers and local volunteers, as well as disease, ran the Indians out of the county by 1877. The area between the Rio Grande and the Nueces River, which included Zavala County, became disputed territory known as the Wild Horse Desert, where neither the Republic of Texas nor the Mexican government had clear control. Ownership was in dispute until the Mexican-American War. The area became filled with lawless characters who deterred settlers in the area. An agreement signed between Mexico and the United States in the 1930s put the liability of payments to the descents of the original land grants on Mexico. Dimmit County was officially established in 1858 from parts of Bexar, Webb, Maverick, and Uvalde counties. The county was organized in 1880. Carrizo Springs became the county seat. It is named for Philip Dimmitt, a major figure in the Texas Revolution. The reason the county name differs is because the bill creating the county misspelled Dimmitt's name. The same situation resulted in the 19th century in Kearney, Nebraska, when that community was named for Mexican War General Stephen W. Kearny. John Leffler, "DIMMIT COUNTY," Handbook of Texas Online (http://www.tshaonline.org/handbook/online/articles/hcd09), accessed January 23, 2016. Uploaded on June 12, 2010. Published by the Texas State Historical Association. As reported by the Census Bureau, the county has a total area of 1,334 square miles (3,456 km2), of which, 1,331 square miles (3,447 km2) of it is land and 3 square miles (9 km2) of it (0.27%) is water. All of Dimmit County is served by the Carrizo Springs Independent School District.